As summer solstice approaches the weather has calmed down, the Hippas are rolling in and fishing continued excellent! Our annual solstice gathering on the rock was a hit, although my sleeping pattern was slightly altered, which turned out to be a positive on my boat today. 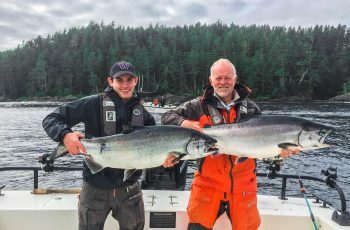 Top fish of the trip was cranked in by Andy Batrell, out fishing with his dad Fred in Predator 1. 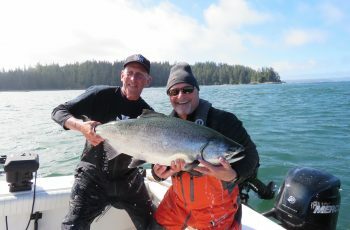 At four thirty, they hit her deep in Mutton, Buds favourite slippery location to fish, saw the tyee jump myself, what a tough fight! Thanks to guide Chris for the release and such a nice way to end the trip. Taylor Brown grabbed a 30 , Don Campbell snuck a 34 in the first day of the trip with Miracle, out at Cohoe, Todd Stanberry angled a 34 out with his dad Mike, fishing in Boat 11. This was a west side story, very nice fish boys! I was out again with Mike and his son John and we started slow, pounding it out at Lacy. Nothing was going early, but boats kept arriving as all other areas were not producing. 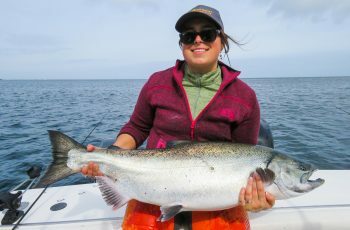 We only had a 6 lb coho until 9am when Mikes rod buckled, the downrigger thumped and the fish screamed off the rigger, yes, had a hot one. This fish was side hooked and was not giving up, as we drifted off through the crowd, into the mist, and with the running tide out into the deep. 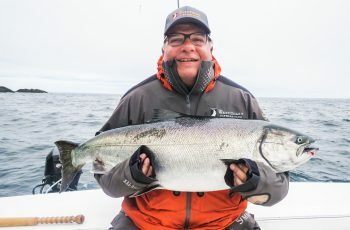 Mike put the screws to her, full pressure and then some and after twenty mins, we had her to the net, where Mike lifted her with the fishing rod arched high over his head, right into the net bag, a perfect 33 lb chinook. Go time now, filled my hippaquarium up half way and into the pool she went to recover and gather her thoughts, her lucky day, she was going to soon be swimming again. we measured and took some pics, amazing how strong a swimmer the tyee was, enjoying the tub, free from predators as she rested a few minutes. So happy to gently lift the fish up, supported well under the belly and over the side, once she tasted freedom, off like a bullet heading into the deep. Now that is what it is about for me and long time guests the Thrones! Back gently mooching along the rock, this time rounding the point heading west, about one thirty, and another thump, rigger arm taking a big jolt, Mike reeling rod tip down, and slam, another hard hook set, a screaming chinook, dancing on the surface and back towards Mutton. No boats in the way, all in eating, so Mike worked the fish, I slipped up to a bow chair for an apple and a short break, thinking it was a smaller king. Situation was non chaotic, perfectly executed, no boat chasing, a perfectly scripted fight, and soon another tyee in the bag. 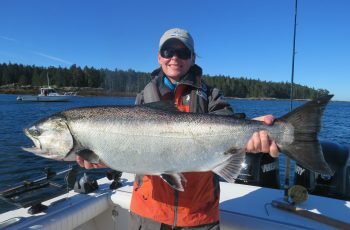 This one a 40.5 inch length by 26.5, we had a 34 lb tyee to release. Two tyee set free on the same day for the Thrones, thanks again guys, pretty proud of that. So eight tyees on the trip, half released, makes me and the guides happy to see this. Fishing is good, a bit more size in the area. 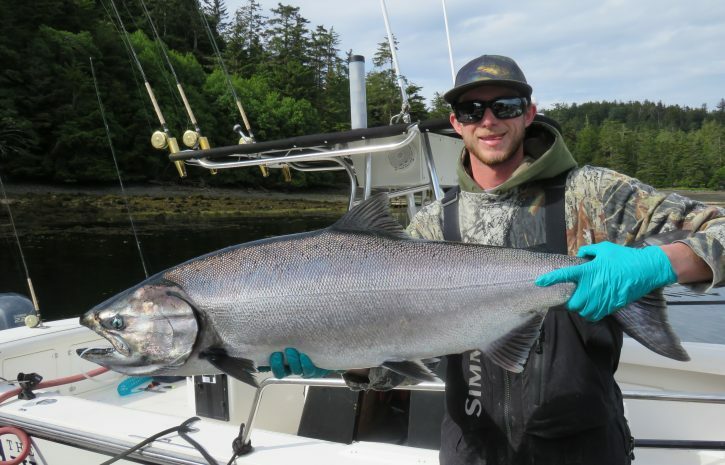 East side is very slow, lions are claiming inner Langara, but we have lots of options with the big whalers. this is a west side story so far this season, always a bit different every year. The halibut guides did well today with calm water, thumped em hard, heavy hauled halibut of all sizes. Connelly in boat 17 had em easily, as did Pred 1, Jordie had two size large, seemed all guides pounding out west had fish, Pat had a big one in his secret jiggery, all boats did well. Kory potted down Matt, but both guides filled guests quotas, big halibut day in here. for silvers. got any suggestions on types of flies or tel# of someone how does. Great story Mike. There will be a bunch of us with Nampa Valley Helicopters arriving next Thursday. Most of us feel the same way and let the big ones go but sure look forward to taking some Chickens home. Exited to catch up with you guys, we have been to the other joints but first time for most at your place.